If this is your first time here, hello! Welcome to Supper in the Suburbs! You’re in for a real treat!!! 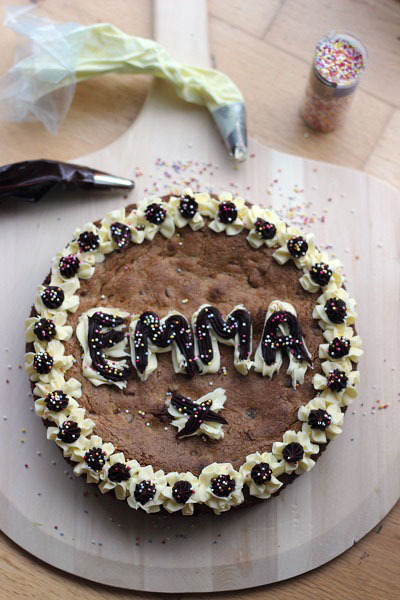 Here you’ll find the recipe for my absolute favourite recipe – a copycat of the Millie’s Cookies Giant Iced Cookie Cake. Not quite a cookie and not quite a cake it’s a dense, chewy, fluffy cakey delight studded with bitter sweet chocolate chips, iced with vanilla and chocolate buttercream and decorated with rainbow sprinkles. What’s not to love? This recipe has now been on the blog for a good 18 months and in that time it has received A LOT of attention, which you’ll see in the comments below. A few people have had a few hiccups along the way to cookie cake perfection but I can assure you that this recipe WORKS as many of my readers will happily tell you! Made this for hubby’s birthday yesterday and it’s amazing! And dangerously moreish! This is one of my favorite copycat recipes; fun and delicious! I use this recipe for birthdays, anniversaries, an excuse to bring cookies/cake into the office and I’ve even done a heart shaped variation for Valentine’s Day. The possibilities really are endless and you can decorate it any way you choose! If you’re having any trouble with the recipe please don’t hesitate to drop me a comment below. But here are a few helpful hints that should help you along the way to Giant Iced Cookie Cake perfection. Check your oven temperature – it’s amazing how much the internal heat can vary from what it says on the dial! I have a handy oven thermometer so I can be sure what temperature I’m cooking at. They are very cheap but worth their weight in gold! Use butter “sticks” or a butter “block” not the spreadable kind from a tub! Make sure you use self-raising flour not plain flour or you won’t get any rise and the cake will be super dense. Chill the mix before baking on a hot day. If you find the butter has melted and the mix is a little wetter than you expected chill the mix just like you would a cookie dough before putting it in your tin. Find the recipe below for a cookie-cake as close to a Millie’s Cookies Giant Iced Cookie as you’ll get in your own kitchen! They key to this recipe is to use a mix of brown and white sugar and to use A LOT of bitter sweet chocolate chips. I find that milk chocolate is just that little bit too sweet. You’ll be grateful for the bitterness that the dark chocolate brings. This giant cookie cake is part cookie and part cake making it a great alternative to a regular celebration cake! Beat together the butter and sugar until creamy and light. Add the eggs and vanilla and continue mixing until the eggs are fully incorporated. Next, fold in the flour a little at a time until a stiff batter forms. Finally stir in the chocolate chips before spreading into a large cake tin (no smaller than 10"). Bake in the centre of your oven at at 350F or 180C, for 25-35 minutes or until the cookie cake is golden brown and the cookie bounces back in the middle when touched. Decorate with your favourite buttercream and sprinkles! Top tip: If you don't have a tin, spread the mixture out evenly on a baking sheet lined with baking parchment. Trim any straggly edges when it comes out of the oven. When iced in the same style as Millie’s Cookies you’d never know that this was cooked at home – until you slice into it that is! It is SO close to the Millie’s Cookies Giant Iced Cookie but it is ten times better because its got that extra cakey-ness which takes this from just an oversized cookie to a real show stopper! Like this? Then you’ll love some of the other cakes and bakes I have on the blog. Nice! BUT, because i’m a bad person I cant do grams for biscuit making, only do ounces! Me too! Looking back over my ‘cooking journey’ made me realise that I prefer ratios over all the diverse weighing systems and I found a great book by Michael Ruhlman called unsurprisingly Ratio. It’s fab give it a read it really helps your cooking. Oooh sounds interesting I’ll have to see if I can hunt down a copy! Aww fab! If you do give it a go I’d love to see pictures :-D! This is one of my favorite copycat recipes; fun and delicious! Our kids will go gaga over this one; thanks so much for sharing! My pleasure I’m glad you like it! It’s not only delicious but I’m sure the kids will have a ball customising it too! Wow…that is awesome….you made your own cake. At least you got exactly what you wanted. It’s like a birthday present from you to YOU!! Hope you enjoyed it…it looks yummy!! Happy belated birthday! This looks so good! Two of my kids have birthdays next month, I think I know what I’m baking to celebrate! Thanks Melissa!!! I’m sure they will love it! Don’t forget to go crazy with thr sprinkles – a birthday must! Hi dot. Sorry to hear you had some issues! Can you confirm precisely what went wrong. We’ve made it lots of times and it makes a very dense cookie cake. Hi Jodie, any vanilla essence or vanilla extract will do just fine! If you leave it out completely it won’t be the end of the world 🙂 Enjoy! My giant cookie is currently in the oven…….it’s not a cookie, it’s a cake! I don’t know what went wrong as I followed the recipe. My batter didn’t look like the one in the photo on the blog, it was much wetter. I was going to use this recipe for Father’s Day, but I’m not sure now. Any ideas on what I have done wrong?? Oh no! Rebecca I’m really sorry to hear that! It is a “cookie cake” so the texture should be somewhere between the two. That being said it most certainly should have been more like a dough than cake batter. How wet and runny was it when it went in? It may be that it comes out more like a cake – hopefully it will still be delicious! There was nothing doughy about it, more a Victoria Sponge mix. I’ve baked it for long as it was still slopy in the middle after 35 mins. It looks good, but not what I was looking for. I’m gutted for you Rebecca! I can only imagine there wasn’t enough flour in the mix cake baking is such a science. If it still needs to cook in the middle I’d recommend covering it in foil to stop it browning and placing it low into the oven until cooked all the way through. Hi there! making this now! did you use melted butter? or just room temp? Hi Beth! Butter should be room temp 🙂 enjoy! Nice idea but i did it exactly as the recipe and cooked it for less than the time suggested and it was like a very over done cake – all sawdusty in texture although the flavour was nice – did i do something wrong??? Hi Janey. What flour did you use? I’ve not heard anyone say it’s sawdusty before! Sorry it didn’t turn out quite like you’d hoped. 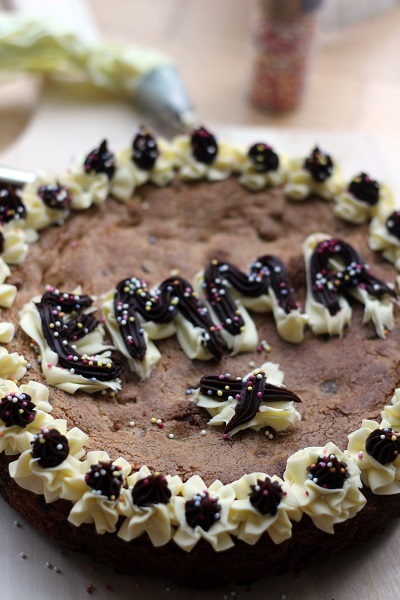 Hi K. Just want to be clear this is a “cookie cake” as it says in the title. It’s neither a cookie nor a cake but a hybrid of the two! I’ve used this recipe numerous times now and it always turns out perfect and totally scrumptious! There’s nothing better than a giant cookie! Need to try making one for a birthday sometime! My kids would love it! Giant cookies are the best!!!! Yum! Cookie cakes are perfect for so many occasions. And I’m with you…bittersweet chocolate or at least semi-sweet is better than milk chocolate! We do often chuck semi-sweet in if that’s what we’ve got to hand! A mix of both is quite nice too 🙂 glad you like the recipe Andrea! I made the cookie cake last weekend and it was so good! Hi there what chocolate drops would you recommend? Do you mean plain chocolate or dark chocolate? Hey there plain or dark will work just fine! How do you make the heart shaped version? Is there a special tin I need to buy or do you bake and stick together afterwards? Though I know a friend who shaped the dough into a heart shape straight on to a baking sheet. You could use rolled up tinfoil to stop it spreading! Hi I made this yesterday for my husband, I did exactly the same as the recipe said and I found it quite dry and crumbly. What did I do wrong, I will be trying it again sometime though. Hi Linda. Which size eggs were you using? Make sure you have large eggs and if its a bit criumbly try adding some milk. Enjoy! The texture is somewhere between an cookie and a cake. Perhaps thats why it has more of a crumb like texture? Hi Emma thanks for your comment. I’d use a tsp of extract – though it’s hard to say as different brands have different strengths! For the icing I use the basic mix of 150g butter to 300g icing sugar. You can add a splash of milk if its too thick to pipe. For chocolate buttercream, 75g milk chocolate, 200g butter 400g icing sugar 4 tbsp cocoa powder. Whisk together the butter, icing sugar and cocoa powder then melt the chocolate (let it cool down) and then mix into the buttercream. Hi, how many calories would he while cake contain?? Hi Leila. I’m afraid I’m not able to calculate calorie content as it will decide on a number of different factors. The short answer is ALOT! Fab recipe….. my son didn’t want a cake for his birthday but loves cookies so I made this….It went down very well…. Hey I am planning to make this and wanted some help with the buttercream for decoration. Was this home made? If so could you advise? Hi there! It certainly was homemade. The best ratio is 2:1 icing sugar to butter. So for 200g icing sugar use 100g of butter. I also add in some vanilla paste and a splash of milk until it’s a good piping consistency. For chocolate buttercream swap out some of the icing for cocoa powder 🙂 enjoy! Hey thanks for the help with the buttercream. Could I use a tart tin to bake this in? I haven’t tried it myself. What kind of tart tin is it? It will probably help if it’s loose bottomed and I would try and line it with greaseproof paper if you can!